It’s hard to believe, but I have been writing for Fit Bottomed Girls for more than two years (wow!)! And in that time I have met a variety of incredible fitness people and taken more than my fair share of fancy new classes all over New York City. However, no one has ever offered to drop by my place and show me their fitness inventions in person until Flohery Mahoney, founder and creator of the Da Vinci BodyBoard, did just that. Score! 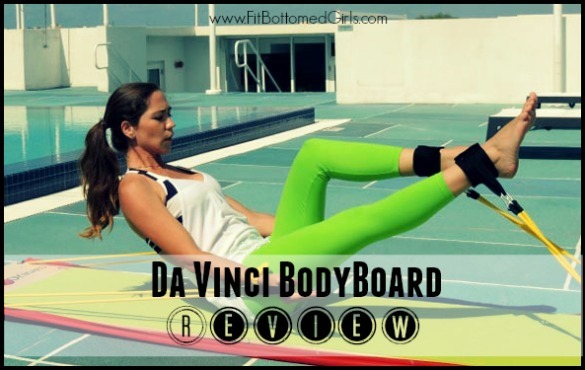 If you are not familiar with the Da Vinci BodyBoard, check out this clip from “TODAY” — but, in essence, it is a “core board” with exercise bands created by Flohery to work several muscle groups at one time while providing a quick and effective cardio workout. The BodyBoards are 8-feet by 2-feet and come either flat or in a foldable format that includes several bands and a soft mat. 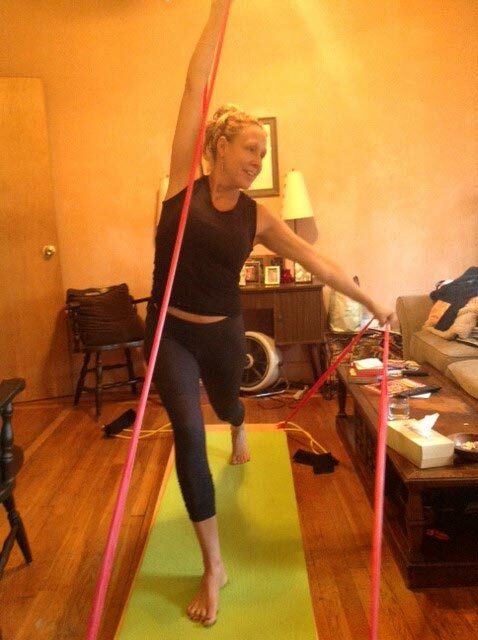 Flohery was a runner, a single mom and a business owner who was seeking a low-impact workout she could do from home that would strengthen and tone her body without causing stress to her joints. After experimenting with bands and tubes tied to her furniture, she came up with the idea to create a flat surface and attach the bands to it to alternate levels of resistance. After tinkering with the design several times, she came up with the Da Vinci BodyBoard. Using the ankle bands with my ab work gave me extra resistance that I could feel right away. This is NOT a wimpy “bands” routine. You will be working your abs, back, shoulders, quads and hamstrings, all while lengthening your muscles with each movement. If you are curious to try out the Da Vinci BodyBoard for yourself, classes are starting to pop up across the country. (Find one in your area here.) Or, like I did, get one and use it at home. It’s really a great workout! And the DVD rocks. It probably could have used a manual with how to set up the board properly, but the DVD is very helpful and they have a helpful You Tube channel, too. Plus, it features some of the best music I have heard on a workout DVD in quite a while! Fit Bottomed Line: If you’re looking for a full-body workout you can do at home that gives you both cardio and strength training in one, this could be your BodyBoard. Those who dig Pilates and dance will really dig it! Nice review, Margo. I love my Da Vinci BodyBoard– its fast and fun. I feel energized after a 20-min workout and a little sore the next day. Floery created a very cool system. How intriguing. The standard price is $298, which includes shipping. I’m eager to learn what the discount will be. Thank you. Oh I’m in love, but not with that price. Wishlisted though. Thanks for the lovely review! what is the discount on the bodyboard? Purchased through their website. However, NO instructional DVD. Reply from company was not offered any longer. I cannot access instructional videos through members. The company has stopped replying to me. $398.00 expected better customer service Stuck without any guidance Does anyone have old DVD willing to sell?